In the 1950s women were told how to lure their man to the altar. Once married, they were told they could have it all – washing machines, fridges and TVs. But the deal was: stay in the home, cook, and bring up the children. Perfect Wives in Ideal Homes is a story of submission and struggle, rebellion and reward. It is the story of our mothers’ and grandmothers’ lives. Perfect Wives in Ideal Homes was Viking’s lead non-fiction title for Spring 2015, and follows its predecessor (Millions Like Us) in tracking the 20th Century through the experiences of women from 1950-1960. Turn the page back to the mid-twentieth century, and discover a world peopled by women with radiant smiles, clean pinafores and gleaming coiffures; a promised land of batch-baking, maraschino cherries and brightly-hued plastic. A time before the Pill, when divorce spelled scandal, and two-piece swimsuits caused mass alarm. Many of us today first opened our eyes onto this world. 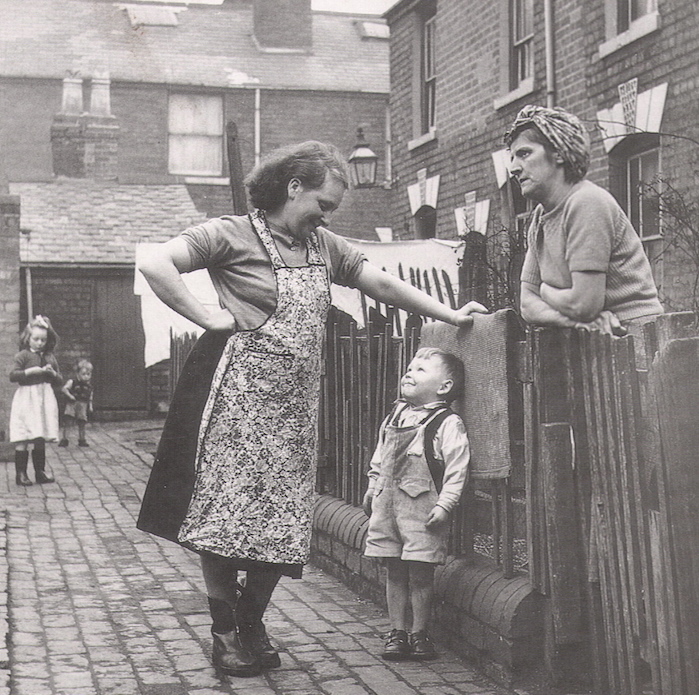 In 1951 British women helped to throw out the government that had brought them the Welfare State, and elect one that would deliver full employment and a consumer boom. "We’ve got everything now. I’ve a fridge, a washer and a television set, and that’s all I want in life…"
But were our mothers and grandmothers really so easily satisfied? "As a girl I wanted to be a lawyer. My headmistress said it wasn’t for girls…"
Higher education was seen as husband-hunting. Ambition meant being a secretary and marrying the boss. In Perfect Wives in Ideal Homes Virginia Nicholson reconstructs the real 1950s, through the eyes of the women who lived it. 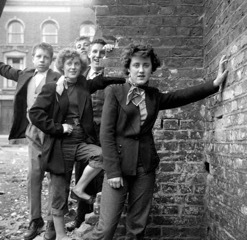 We meet factory girls and Teddy girls, students and housewives, diplomats and immigrants. We meet women who thought you got pregnant if you kissed a man. Women whose gloves matched their handbags. In the ’50s femininity was for sale as never before. The dark side of the decade encompasses rampant prostitution, a notorious murder, and the threat of nuclear disaster. Here is a narrative of frustration and fear – but also of beauty contests, optimism and rock’n’roll. Step back in time - to the back-to-backs and the post-war suburbs. Here, where our grandmothers scrubbed their doorsteps, cared for their families, lived, laughed, loved and struggled. Soon after her sixteenth birthday, Leila Williams first dipped her toe into the world of beauty queens. A cocktail dress was bought, her hair was styled. ‘I was a nervous wreck.’ Fortified with sherry, she stumbled into the makeshift backstage dressing-room, milling with girls titivating and powdering. ‘It was complete chaos'. It was a watershed moment. Reporters flocked round her; as a schoolgirl beauty queen, they wanted to hear what she had to say, and her confidence soared. And while I was standing there, I could hear some of the spectators saying ‘What a shame…’ By now I was beginning to think I was deformed. But what they were actually saying was, ‘What a shame she’s so thin!’ So I went back home and fattened myself up. The magazine Good Housekeeping, which by 1957 had a circulation of over 200,000, opens a window on to the imperatives of the 1950s homemaker. Leafing through 1950s copies of Good Housekeeping is to enter a world peopled by women with radiant smiles, clean pinafores and gleaming coiffures. One senses a slight ache of nostalgia at the aspirations of these beatific wives. Does some part of us wish to be like them? The accompanying text guides us round a promised land of batch-baking and the latest in home technology, brightly-hued plastics and man-made fibres that simplify life and save time. Queens in their kitchens, these lovely ladies are always conscious of how best to support their husbands in their professions and help them get ahead in their career. They have much invested in that key promotion. And their kitchens are indeed delightful: ‘the gayest room in the house’, with cheery red coal-scuttles, yellow enamelled storage jars and matching casseroles. They are modern, too. ‘Is your Kitchen a happy place? Think what a difference “FORMICA” would make…’ And they are spotless. The sinks are disinfected and the dishcloths boiled. The store cupboards are full of jams, jellies and bottled beans, and free of weevils too, because Good Housekeeping wives are careful to keep cereals in closed jars and mop up spills immediately. They are clever cooks, who know the secret of success with yeast dough; they have wonderful ways with mince and they can set a junket. Their clothes are always correct for the occasion, summing up ‘elegance imparted by a deceptive simplicity.’ In spring they hand-make a rose of snowy white piqué, starch it and pin it on to their lapels. They may also make a ruffled white piqué umbrella case to match. They are accomplished needlewomen and quite capable of sewing a Viyella shortie nightdress and a pair of stripy Tyrolean bib shorts in Super-Tremendo cotton from a ‘Simplicity’ pattern. Nor are they defeated by simple DIY jobs. They know how to give their old clawfoot bath-tubs a facelift with clever boxed-out panels cut to measure, or construct a telephone shelf out of three-ply. They would have only themselves to blame if their husbands looked elsewhere. 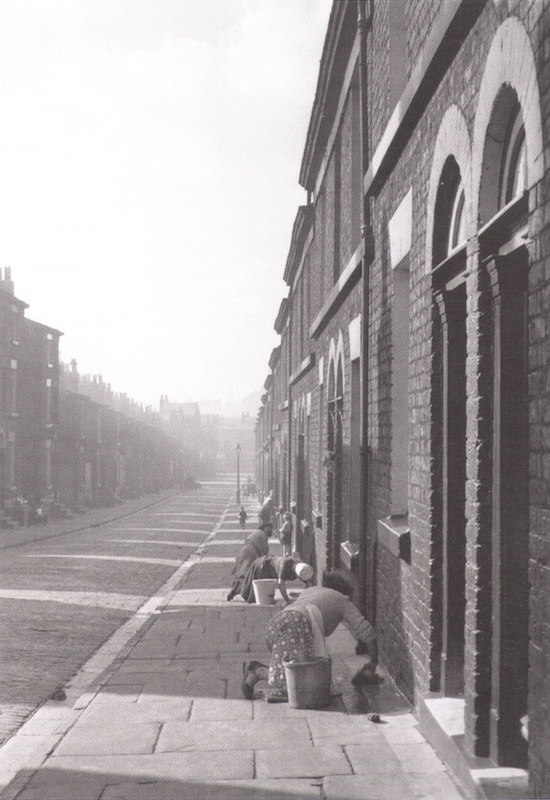 Donkey-stoning: a daily spectacle in working-class neighbourhoods in the 1950s. 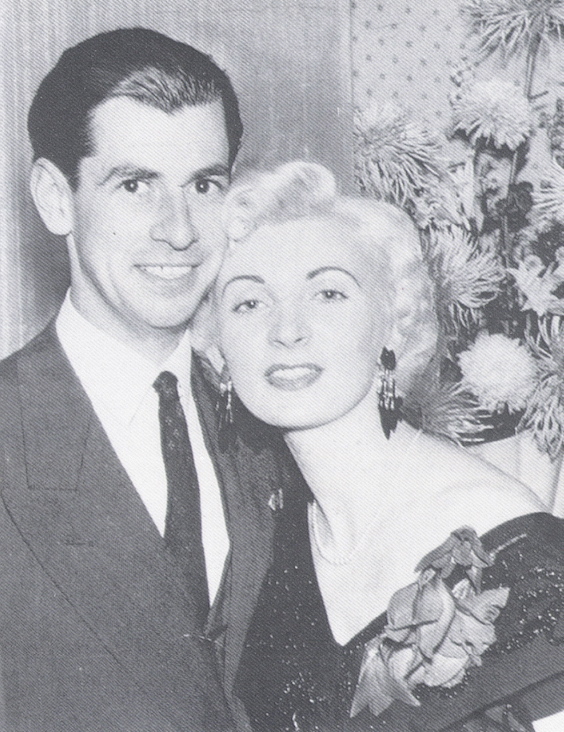 Glamorous and lighthearted: Ruth Ellis and David Blakely at the Little Club in 1953. His murder by her in 1955 was the crime passionnel of the decade. Working-class mothers taking a break from their chores, 1950. The 1951 election campaign. 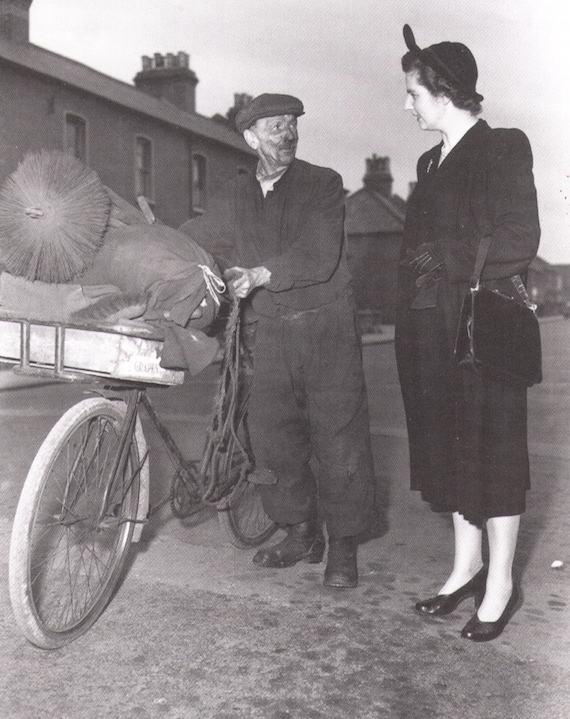 Margaret Roberts tries to persuade a Dartford chimney sweep to vote for her. She lost, but from 1958 her political rise was unstoppable. ‘I still can’t believe it’s true – a washing machine in MY kitchen!’ The family is enraptured, and the neighbour peers enviously from behind Mum’s kitchen curtains. 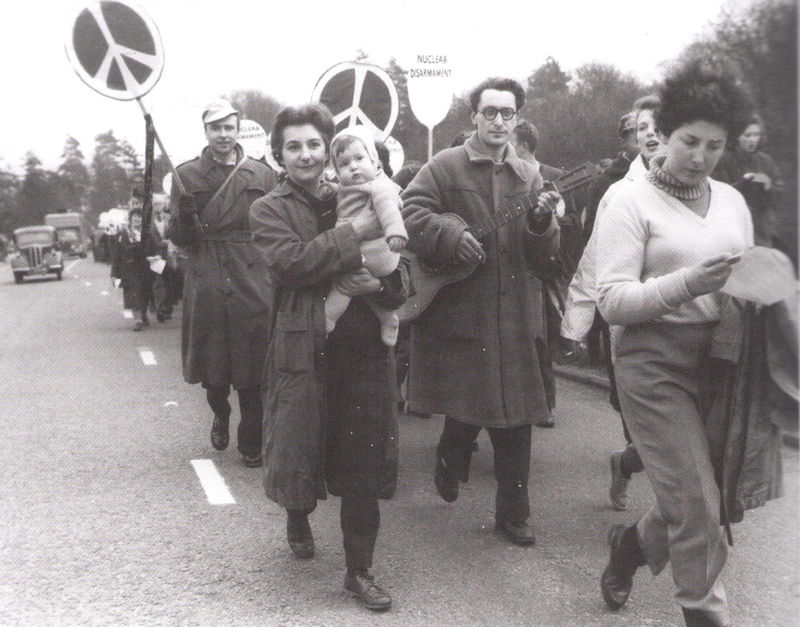 Dora Russell in 1958, setting off in her battered charabanc on the Women’s Caravan of Peace. 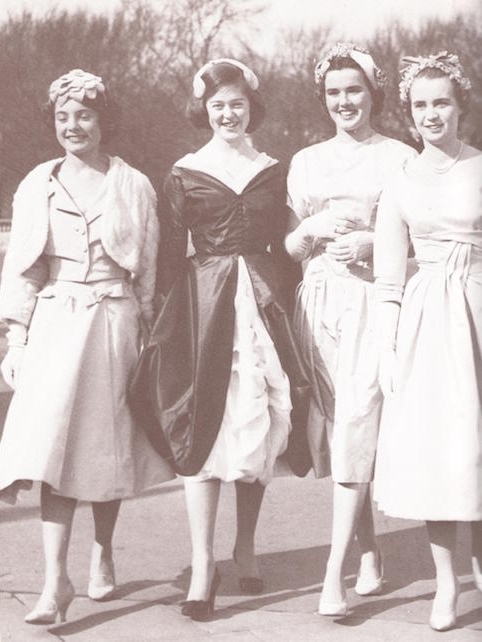 The last Palace presentation was held in 1958; four debutantes smilingly offer themselves up as upper-class wife material. The historian Virginia Nicholson is steadily working her way through the female 20th century and I very much look forward to Perfect Wives in Ideal Homes: The Story of Women in the 1950s (Viking, March). Nicholson is a brilliant and tireless researcher; every page will be replete with both startling facts and intimately personal stories. As [she] explains in her introduction, much of the raw material for her book derives from interviews, so the challenge was to weave a readable narrative from a wide variety of experiences and disparate backgrounds. In creating a story of frustration, fear and ignorance where the dominant desire, linking debutantes to factory girls, is to escape the confines of their birth, Nicholson succeeds brilliantly. Virginia Nicholson said that in the researching, this book felt like time travel. What she has created, gathering together dozens of different personal accounts from the decade, is an important and humane book of female social history. Nicholson, the great-niece of Virginia Woolf, has written acclaimed books saluting the women of both world wars. In this work, she again musters voices to profound and deeply political effect. The image of the perfect stay-at-home wife, as she puts it, still refuses to lie down and die. Much of the material in this book will be familiar to women over 55: we were born into this world. For younger women, though, Nicholson’s book should be necessary reading, to remind them how far we have travelled. And to explain precisely why so many of us of Fifties vintage became implacable feminists. An intimate voyage back to the 50s. There is warmth in [Nicholson's] curiosity as she delves into the stories of her mother's generation. She is as adept at recreating the daily life of a lesbian debutante as of a communist undergraduate or a working-class woman whose life is transformed by the arrival of a hire-purchase fridge. An indefatigably researched, moving and perceptive book. Virginia Nicholson handles her wide-ranging material with sympathy, humour and a lightness of touch; her enviable gift for interpretation and storytelling is balanced by first-hand accounts of those women of the 1950s who have trusted her with the intimate details of their lives. Our view of the decade tells us more about ourselves, of course, than the complex truth of the time, something that becomes clear while reading Virginia Nicholson’s insightful social history… Nicholson, mixing research with anecdote, brings history to vivid and touching life. She has a feel for the mood and detail of the period: the mended nylons, bracing holidays at Butlin’s, the small but sustaining thrills of ordinary people. The era was only 60 years ago, yet it seems a world away. 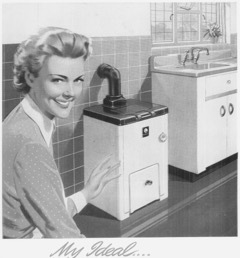 In Perfect Wives in Ideal Homes, Nicholson presents the lives of women in the 1950s as a foreign country. The author uses vivid contemporary sources and oral testimony to show the constraints under which so many women lived. As social history, it bears comparison with David Kynaston’s Family Britain. Nicholson has the same knack of seamlessly piecing gripping individual stories into a panorama of everyday life. This fascinating slice of social history is detailed and scholarly yet immensely readable. Nicholson has the gift of bringing her women to life like characters in a novel. Richly detailed... Nicholson is a generous writer... [Her] commentary is by turns compassionate and wry. She is admirably outspoken about the male-defined, church-defined sexual double standard on the day. The book is enriched by its notes and bibliography, which make it a valuable resource, sending us off to read memoirs and autobiographies in full. Nicholson provides an intimate patchwork of personal histories... From housewives to princesses, their testimonies add up to a rich and moving history. [Sylvia Plath] was shocked by the bombed-out buildings still visible in English cities, the badly-made clothes. She embodies the contradictions of this era that Nicholson spells out so well: a new world dressed in old clothes. An uplifting and heartwarming read. The achievements of the women in this book haunt us and move us to admiration… There’s plenty in the 50s to deplore, and half-enjoy deploring. Perfect Wives in Ideal Homes… poignantly illustrates how the women of the 1950s yearned for the innovative technology of the era to liberate them from repetitive drudgery. Historian Virginia Nicholson aims to shed light on the day-to-day reality of women’s lives in the 1950s in this meticulously researched volume combining written and oral testimonies.